Spanish explorers were the first Europeans to explore the coastal regions of present-day South Carolina. 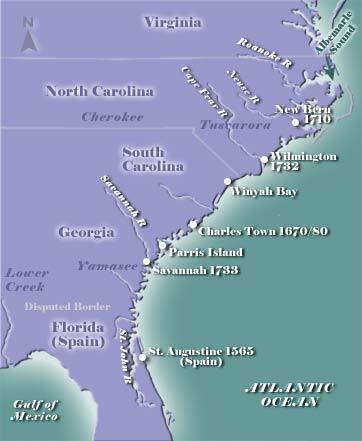 In 1521, Francisco Gordillo sailed to the Carolina coast from his base in Santo Domingo; no settlement was attempted, but several dozen Native Americans were enslaved. Five years later, Lucas Vásquez de Ayllón sponsored a short-lived effort to settle several hundred persons in the Winyah Bay area (near present-day Myrtle Beach), but unfavorable weather and sickness soon forced a return to Santo Domingo. Nonetheless, later in the 1500s the Spanish established new bases in Florida and spread northward with a string of small settlements. The French presence was established in 1562 when Jean Ribault brought a group of French Huguenots to Parris Island, but Spanish power in the area rendered the colony untenable. The English claim to the area arrived with the 1497 voyage of John Cabot, but efforts to colonize did not occur for more than 130 years. In 1629, a grant was awarded to Sir Robert Heath, which included today's North and South Carolina and all land westward to the Pacific Ocean. No settlement activity took place under Heath and in 1663, the lands were granted to eight of Charles II's most loyal supporters, the "lords proprietors." Lord Anthony Ashley Cooper, assisted by the political philosopher John Locke, drafted the Fundamental Constitutions of Carolina (1669), an intricate and romanticized feudal scheme that was further burdened by the recommended use of grandiose titles for the nobles and their retainers. Whether or not the cumbersome system was seriously intended to be implemented or was simply a means to appeal to the high-born settlers' vanity is not clear. A small settlement under the authority of proprietor Cooper was started in 1670 at Albemarle Point; 10 years later the settlement was moved a short distance to the peninsula between the immodestly named Ashley and Cooper rivers. The community's name of Charles Town honored the king, but was changed to Charleston at the end of the War for Independence. By the late 1680s, the colony was beginning to enjoy prosperity, especially in the coastal areas. Its economic base depended initially on the fur trade, which fostered generally good relations between the Carolinian settlers and the local Indian tribes. Tobacco production flourished briefly, but was supplanted by rice. Some years later, indigo was introduced and became the second most important product. Both depended upon slave labor and elaborate plantation systems. Black slaves soon outnumbered white settlers, a matter of such concern that programs to encourage white immigration were started. In the early years of the 18th century, southern Carolina became home to thousands of immigrants  Germans, Swiss, Welsh, Scots-Irish and migrants from colonies to the north. Plantation owners often sought to escape humid summers in the interior by taking up residence in lavish town houses in Charles Town, which became a lively and cosmopolitan city. Development of western lands was quite different from the east. The frontier did not lend itself to plantations; it was settled primarily by subsistence farmers. Pirate raids on coastal shipping and communities, chiefly the activities of Blackbeard. In 1712, the proprietors acknowledged the different perspectives of their colony's northern and southern sections by granting to each a separate governor and assembly. Complaints continued, however, and in 1719 the Crown purchased the colony from the absentee proprietors and appointed royal governors. In 1729, northern and southern Carolina were formally divided, and in 1732 the southern portion of South Carolina separated and became Georgia a year later. Packet #3: The Spanish in South Carolina: unsettled frontier No longer in print - but now available on CD-ROM as part of the Educational Document Packets, 1-8 The Formation of Counties in South Carolina Michael E. Stauffer. 22 pages. Maps PH18....$4.